Apricot phytophthora root rot is a serious disease that is difficult to control. Phytophthora on apricots is impossible to detect aboveground prior to a significant portion of the root system having been killed off. What causes apricot phytophthora rot? Are there any effective control methods for apricot trees with phytophthora rot? The following article contains information about the symptoms and disease cycle of phytophthora root rot of apricots. What Causes Apricot Phytophthora Rot? Several species of phytophthora cause crown and root rot of a wide array of trees and shrubs including members of the Prunus genus like cherry, peach and apricot. Apricot phytophthora rot is fostered by orchards planted on poorly draining soil. Phytophthora root rot of apricots is a fungal disease that kills tiny rootlets and progresses to larger and larger roots until it reaches the crown of the tree. Because the disease is underground attacking the roots, it is often too late by the time symptoms manifest above ground. Above ground symptoms of an apricot tree with phytophthora rot present in the canopy. They include wilting, early fall color (senescence), smaller than normal foliage, and leaf and branch dieback. All of these are indicative of a lack of water and minerals being taken up by the tree. Severely infected trees have stunted shoots and canopy dieback. Newly transplanted trees with the infection usually have little to no new growth and an overall general decline in health. Phytophthora on apricots can best be diagnosed by looking at the cambium at the root crown. Infected cambium and primary lateral roots will be tan to cinnamon-brown in color instead of off white. There will be a lack of feeder roots accompanied by black, decaying roots. Phytophthora lives in the soil and thrives in wet conditions. This species produces an asexual swimming sport that can spread throughout waterways. 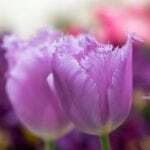 It can survive in the soil for years but cannot live for any length of time in dead plant material. As mentioned, the disease is extremely difficult to control. 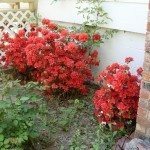 Avoid purchasing nursery stock that shows any of the canopy signs mentioned. Examine the roots prior to planting for any evidence of the disease. Avoid planting susceptible hosts in wet soil or annually flooded areas. If the disease can be pinpointed in its infancy (which is difficult to accomplish), soil drench fungicides can slow the development of the disease. They are not, however, always effective. Minimize transplant shock to the root system by planting at the proper depth and prepping the planting area. Keep the tree healthy by providing regular irrigation and by mulching around the tree base. Unfortunately, phytophthora is a widespread species making eradication impossible in soil that is routinely wet or flooded. 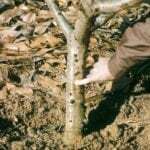 Avoid planting in any areas where the disease has a history including old orchard sites.